The EU as a political construction is in a state of terminal decay. We know this for one reason and one reason alone: its core principal is the state is superior to its people. A system of government can only work over the longer term if it recognises that it is the servant of the people, not its master. It matters not what electoral system is in place, so long as this principal is adhered to. The EU executive in Brussels does not accept electoral primacy. It shares with Marxist communism a belief in statist primacy instead. The only difference between the two creeds is Marx planned to rule the world, while Brussels is on the way to ruling Europe. The methods of satisfying their objectives differ. Marx advocated civil war on a global scale to destroy capitalism and the bourgeoisie, while Brussels has progressively taken on powers that marginalise national parliaments. Both creeds share a belief in an all-powerful executive. The comparison with Marxism does not flatter the EU, and suggests it has a limited life and that we may be on the verge of seeing the EU beginning to disintegrate. Despite economic evolution in the rest of the world, like Marxian communists Brussels is stuck with a failing economic and political creed. It has no mechanism for compromise or adaptation. A rebellion from Greece was put down, the British voted for Brexit, which is proving impossible to negotiate, and now Italy thinks it can partially escape from this statist version of Hotel California. The Italians are making huge mistakes. The rebel parties forming a coalition government want to stay in the EU but are looking to exit from the euro. Putting aside the impossibility of change for a moment, they have it the wrong way around. If they are to achieve anything, they should be exiting the EU and staying in the euro. Let me explain, starting with the politics, before considering the economics. As stated above, the EU is quasi-Marxist, placing the state above the people. The Italian government has collaborated with Brussels to enslave its own people as vassals of the EU super-state. If there is a revolt in Italy, this is what the electorate is rebelling against. Faceless eurocrats tell the Italian people what to do and what to think. The people are discontent with both the super-state and their own weak governments. The two parties forming the latest coalition are too frightened to blame the EU, and instead propose to beg for debt forgiveness and say they are considering leaving the euro. But without a clear vision, and understanding why the Italian electorate is discontent, this coalition will turn out, in one of Boris Johnson’s memorable phrases, to be comprised of little more than supine protoplasmic invertebrate jellies. Greece is the precedent. This makes it easy for the EU to deal with the Italians. They will get nothing. The economic argument, that Italy would be better with her own currency, is insane. With a history of weak irresponsible governments, it is far better for the currency to be beyond Italy’s control. However, Keynesian commentators are sympathetic to the weak currency argument, believing that the euro was constructed for the benefit of Germany. Italy, along with the other Mediterranean members, is said to be paying the price. This, they allege, is the fatal flaw in the one-size-fits-all euro. This interpretation of the monetary situation is baloney. It ignores the fact that Italy’s debt rocketed after the formation of the euro, because the cost of borrowing for Italy fell towards Germany’s borrowing rates, thanks to the guarantee of eventual unification. The difference was Germany borrowed to invest in production, while the Italian government borrowed to spend. The problem today is the profligacy of the past has caught up with Italy, and its government must stop borrowing. Setting up a lira alternative, or the mooted mini-BOTs, is an ill thought out concept that only makes matters worse. The mini-BOT proposal appears to be for an issue of certificates backed by future tax revenues to be used to pay the government’s creditors. They would then circulate like bills drawn on the state, but at a discount to reflect both their time value and the fact they are not euros. It seems to not occur to the promoters of schemes like this that the state’s creditors will insist on payment in euros. Promoters of schemes like mini-BOTs are monetary cranks, incentivised by a desire to avoid reality. The Italian government has been using this sort of hocus-pocus for years, mostly with securitisation of future income streams, such as the national lottery. Mini-BOTs appear to be a proposal for just one more throw of the dice. It’s hardly surprising that the Italian people are fed up with their establishment and feel they can only collectively undermine it by voting against it at election time. But it is too late, because the state, and therefore the banks, are already irretrievably bust, a fact barely concealed by the ECB’s funding of the Italian government at near-zero interest rates through the purchase of government bonds. Not only is the ECB in denial over Italy’s financial situation, but also Italy is firmly imprisoned. The disruption of an Italian withdrawal from the euro would be fatal for the EU’s banking system on at least four levels. The support from the ECB for the Italian banks would be withdrawn, which would have the potential to allow a cascade of bank failures in Italy to develop, either as a result of bad debts crystallising within the system, or due to balance sheet deterioration from falling Italian government bond prices. Problems for banks will arise when past loans remain denominated in euros, while their balance sheets are transitioned into a new, weakening currency. The Italian banks lack the margins to weather lop-sided balance sheets, whose assets are denominated in a declining currency relative to the currency of their liabilities. There will be a rush for residents in other Eurozone countries to reduce and eliminate their Italian commitments, amounting to a banking run against the whole country. The only political solution would be to impose draconian capital controls between Italy and the rest of the world, including other EU member states. Lastly, there is the threat to the ECB and the euro-system itself. These require little elaboration, expect perhaps for the threat to the ECB and the euro-system. The ECB has been buying large quantities of Italian bonds, effectively financing the Italian government’s excess spending, at yields that are ridiculously low. 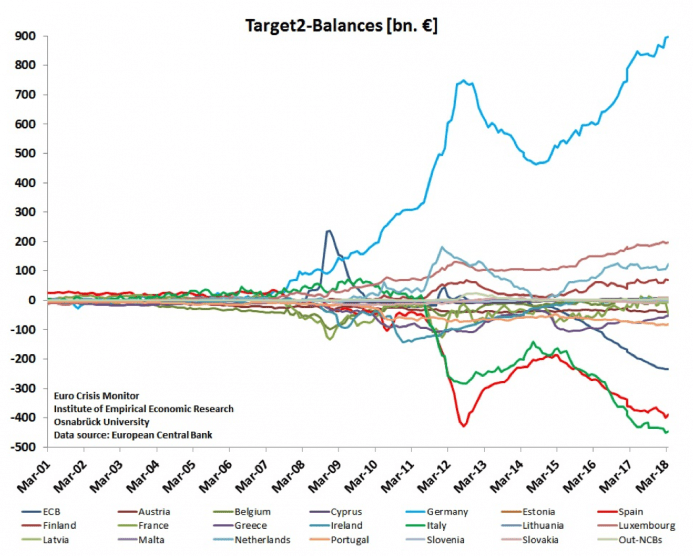 In effect, the ECB has put itself in an impossible position, and as the Italian situation worsens, the debate over the fate of TARGET2 imbalances is bound to intensify.1 These are shown in the chart below, which is of balances at end-March. So long as the euro-system holds together, we are reassured that these imbalances do not matter. However, with the Italian central bank in debt to the system to the tune of a net €447bn, how these imbalances would be dealt with on an Italian exit from the euro without a collapse of the system is an interesting question. And it is worth noting that Spain’s central bank is also in the hole for €390bn, just in case the Spanish electorate, or even the Catalans or Basques get ideas of leaving as well. The Bundesbank is owed a net €896bn and will be extremely nervous about Italy. The ECB itself also owes a net €235bn to all the national central banks. When the ECB buys Italian government debt, the Banca d’Italia acts on its behalf. The Italian bonds are held at the Banca d’Italia, and the money is owed to it. To the extent the ECB has bought Italian bonds, the overall negative balance at the Banca d’Italia is reduced, so its deficits with the other national banks in the system are actually greater than the €447bn shown, by the amount owed to it by the ECB. In short, it is hard to see how Italy can leave the euro without the ECB having to formally guarantee all TARGET2 deficits. It is not impossible and the guarantee is already implied, but the ECB won’t want anyone questioning its own solvency, so we can safely assume an exit will not be permitted, for one simple reason: the system and the banks in it are only solvent so long as the system is unchallenged. The question over Italy’s euro membership may not arise anyway, because the new coalition does not yet know what it wants. The Italians must also be dissuaded from their desire for debt forgiveness, for the same reasons the Greeks were similarly deterred. And as the Greeks found, trying to negotiate with the EU and the ECB was like talking to a brick wall. The Italians will experience the same difficulties. We can dismiss any idea that because Italy is a far bigger problem, they have negotiating clout. A brick wall remains a brick wall. So far as Brussels and Frankfurt (the home of the ECB) are concerned, they are always in the right. The European project and the euro are more important than the individual member nations, and their electorates have no say in the matter. We often take this to be arrogance, which is a mistake. It is worse: like Marxists, the eurocrats have unarguable conviction on their side. Across the table will sit the Italians, with no political beliefs worth mentioning, and all too readily frightened by the consequences of their own actions. This is the way the EU works. Inevitably, in a faceless statist system such as this there are always problems at the national level to deal with. Then there are localised difficulties, such as Deutsche Bank, whose share price tells us it is failing. But in that event, it will doubtless be rescued because of its enormous derivative exposure, the containment of eurozone systemic risk, and German pride. The ECB has shown great skill at bluffing its way through these ands other problems and is likely to continue to succeed in doing so, except for one particular circumstance, which is the crisis stage of the credit cycle. It is a common misconception that the world has a business cycle: that merely puts the blame on the private sector for periodic booms and busts. The truth is every boom and bust has its origins in central bank monetary policy and fractional reserve banking. A central bank first attempts to stimulate the economy with low interest rates, having injected base money into the economy to rescue the banks from the previous crisis. The central bank continues to suppress interest rates, inflating assets and facilitating the financing of government deficits. This is followed by the expansion of bank credit as banks recognise that trading conditions in the non-financial economy have improved. Price inflation unexpectedly but inevitably increases, and interest rates have to rise. They rise to the point where earlier malinvestments begin to be liquidated and a loan repayment crisis develops in financial markets. It is fundamentally a credit cycle, not a business one. Central bankers do not, with very few exceptions, understand they are the cause. And the few central bankers who do understand are unable to influence monetary policy by enough to change it. By not understanding that they create the crisis themselves, central bankers believe they can control all financial risks through regulation and intervention, which is why they are always taken by surprise when a credit crisis hits them. For these reasons we know it is only a matter of time before the world faces another credit crisis. The next one is likely to be unprecedented in its violence, even exceeding that of the last one in 2008/09, because of the scale of additional monetary reflation that has taken place over the last ten years. The further accumulation of debt in the intervening period also means that a smaller increase in price inflation, and therefore a lower height for interest rates will trigger it. My current expectation is that a global debt liquidation and credit crisis is not far away and will occur by the end of Q1 in 2019, perhaps even by the end of this year. The problem is a global one and we know not where it will break. But once it does, the ECB and the euro will possibly face the most violent deflation in modern history, even exceeding the global slump of the 1930s. We know in advance what the supposed solution will be: monetary hyperinflation to bail out the banks, governments and the indebted. The effects on prices in the Eurozone are unlikely to be as delayed as they have been in the current cycle, partly because of the sheer scale of the issuance of new money and credit required to stabilise the financial system, partly because the euro is subordinate to the dollar as a safe-haven currency, and partly because of its limited history as a medium of exchange. ​If I am only half right over the timing of the next credit crisis, it will be at the same approximate time as Britain is due to exit the EU in March 2019. Logically, Brexit should not be deflected by the credit crisis and the Eurozone catastrophe, but the statist instincts of the British government could be to put the whole Brexit process on hold in the interests of global government unity, at least while the management of the larger credit crisis is addressed. The coordination of policy at the G20 level seems bound to take precedence over potentially disruptive political issues such as Brexit. So, despite the referendum commitment, even Britain may continue to be trapped in the rotting EU super-state for a while longer, defying the wishes of the electorate. As foreshadowed in Hayek’s The Road to Serfdom, the EU and the British government will take the opportunity from crisis to increase their control over their individual peoples, eroding further the limited freedoms left to them. Meanwhile, the British find themselves in a similar position to the Italians. The EU simply refuses to accept the British electoral mandate, because so far as it is concerned, it is not a matter for British voters. Brussels is reassured that there are powerful forces in the British establishment that will undermine Britain’s negotiating position. They are confident that Britain will never leave the EU, because it won’t be allowed. Consequently the British Brexit team finds it is trying to negotiate with that uncompromising brick wall. The Marxist-like certainty in the EU’s position compares with the British lack of commitment to any sound position. The Conservative government only pays lip service to free markets, unwilling to argue the case for them. Nor can it stand up for the principal of democratic supremacy of the British electorate, which, despite the mantra of acting on the instructions from the referendum, it appears willing to compromise. It turns out that despite the efforts of Brexiteers such as Boris Johnson, the British government, like the Italians government, turns out to be a supine protoplasmic invertebrate jelly, which places its short-term survival instincts above its electoral responsibilities. At this point, we can only surmise that, like the old Soviet Union, the EU’s political grip remains as firm as ever. The problem is that the denial of free markets and the supremacy of the super-state are gently rotting the EU from within. The Euro-sceptic instinct to abandon it for a more progressive world outside the EU is surely right. But the EU’s precariousness will only be fully exposed by the next credit crisis and the ECB’s monetary response to it, which will end up collapsing the euro. *Alasdair Macleod is the Head of Research at GoldMoney. 1. The Target 2 system, is the settlement system in the Eurozone. I wonder if your other readers are baffled by your republishing of right wing drivel from the Mises Institute. Is this now the direction of the Eurasia Review? Actually, there is no new direction … we publish articles from the ‘right’ and the ‘left,’ from all sides. This is so that readers can read what others are saying, and then make informed decisions … contrarily many other news outlets only publish articles with which they are in agreement.